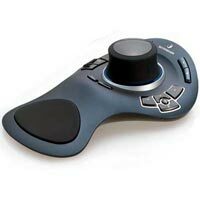 Simply push, pull, tilt or twist the SpaceExplorer's controller cap to simultaneously pan, zoom and rotate 3D objects and environments. SpaceExplorer features an array of easy-to-reach function keys labeled and pre-programmed with commands from leading design applications. Keys automatically map as you move between applications for unified navigation. Using SpaceExplorer together with a mouse engages both your hands in a natural, intuitive work style. One hand drives the SpaceExplorer, positioning your model, then rotating, panning and zooming in one single, fluid motion. Your mouse hand can simultaneously edit the model or select menu items. The SpaceExplorer button array includes two numbered buttons for programmability of the user's favorite application commands, plus keys for Speed, Views, 2D only, Fit, Control Panel and keyboard modifiers. This enables you to master any supported 3D application without having to leave the device to reach for the keyboard.